When learning about the guitar, it is a good idea to know some of the main guitar parts. 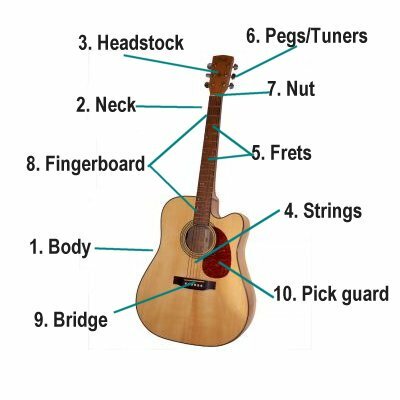 Here are some of the major components that make up the typical guitar. Body - The main part of the guitar. The body is large and hollow on an acoustic to amplify the sound. It can be solid and smaller on an electric guitar. Neck - The neck sticks out from the body and connects to the headstock. The neck holds the frets and the fingerboard. Headstock - The top of the guitar where the tuning pegs sit. Connects to the end of the neck. Strings - The standard guitar has six strings. They are typically steel for electric and acoustic. They are nylon for classical guitars. Frets - Hard metal strips that are installed into the fingerboard on top of the neck. The frets provide a place for the string to end when pressing down with the finger. Each fret and string represent a musical note. Pegs/tuners - The pegs, or tuners, sit in the headstock and hold one end of a string. By turning the pegs, the tightness of the string can be adjusted and the guitar can be tuned. Nut - The nut sits at the end of the neck. It provides an ending point for the vibration of the string so open notes can be played. Fingerboard - The fingerboard is on top of the neck. The frets are installed into the fingerboard. This is where the strings are pressed down to create notes. Bridge - The bridge sits on the sound board and is where the other end of the strings are attached. The bridge helps to translate the vibration from the strings down to the soundboard. Pickguard - Helps to protect the soundboard from getting scratched when playing. Soundboard - One of the most important parts of the acoustic guitar, the sound board vibrates and creates much of the sound and tone of the guitar. Sound hole - Usually a round hole that helps to project the sound from the guitar. Pickups - Pickups change the energy of the strings vibrations into electrical energy. The pickups have a huge impact on the sound and tone of the electric guitar. Electronic Controls - These are knobs on the guitar that allow the musician to change the volume and tone of the sound directly. Whammy Bar - A bar that attaches to an electric guitar which allows the player to change the pitch of the note while playing. Strap - Helps to hold the guitar in position when playing while standing. Capo - A capo can be attached on the fingerboard at various positions to change the key of the guitar. This helps so that you can play a song the same way, but in different keys just by changing the position of the capo.